Book in One Word: GOOD. After reading Angelfall, I was VERY EAGER to read World After. (Especially after that re-read worthy ending. I mean, COME ON. Thank gosh I read Angelfall after its sequel had already been released.) I went into World After hoping for feels and action and banter and, I don't know, maaaybe some kissing, and while all that may not have happened, this book was still pretty darn good. World After did that thing that ALL SERIES to some to do (possible spoiler alert): keep the two love interests apart for a long period time. And by long period of time, I mean, like, almost the entire book. 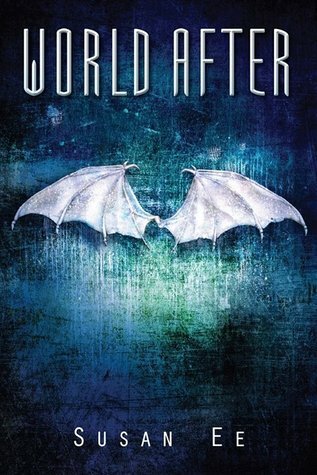 World After picks up right where Angelfall left off, but after reading an excerpt that Susan Ee posted on her website (while waiting for the book to fly into my hands), I figured Raffe would show up right away. NOPE. There were some bits of Raffe, but he wasn't really there until the last chapters of the book. Usually, that would really bother me. And while it might have done so slightly (come on Raffe, where are youuu? ), it actually wasn't a big problem. Susan Ee somehow pulled off the thing that ALL SERIES to some do and make it work (but please don't do it again). Susan Ee's writing is actually pretty simple...but not. She tells the story of Penryn and the End of Days quite well, and keeps readers like me very engaged. Something about this book--this series--is highly addictive, and thank gosh it's a multi-book series, because I don't think I'll ever get enough of it (but those release dates are waaay too far apart). This story is successful in that it deftly combines several elements: a new world, humor (excellent banter and lines and characters for that), adventure, action, romance, crazy things happening to people (see: Paige), FEELS, fantastic, replay that over and over again scenes, and so much more. It just works. These are one of those books that, when I see them on my shelves, I feel admiration and think "I love you." I'm so happy I got into this series because Angelfall and World After are just so good. While the latter was a bit slower in pace than the former, it still brought a lot to the table (and some totally rereadable scenes). If you haven't read these book, I very highly suggest you get right on that. Fall for the angels. These books will be still good in the world after. And OH MY GOSH, I NEED THE NEXT BOOK. Seriously. Give me a title/synopsis/cover/copy ASAP people, because my eyes yearn to read it and my nose wants to be stuck in it. Did I love it? I think so? Would I reread it? HECK YES. Would I purchase it? I already own it, of course. Who would I recommend it to? Obviously read Angelfall first, but I'd recommend this series to anyone and everyone.